Compatible with almost every mobile device - iOS, Android, Blackberry. Welcomes sports bettors from the United States of America. 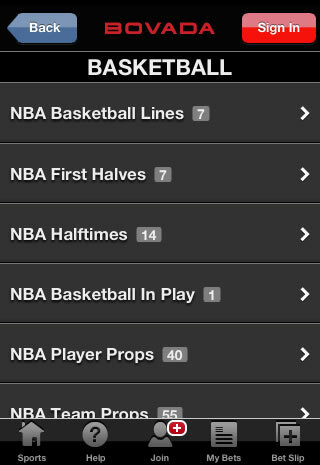 Lines on NBA, NFL, NHL, MLB, UFC/MMA, Soccer, Tennis, Gold & more. 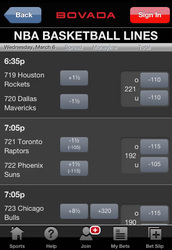 Bet live in-play on thousands of sporting events from your smartphone. Receive a 50% free bet of up to $250 when you make a first deposit. 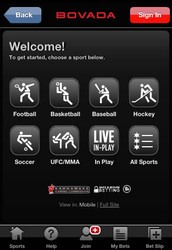 The Bovada Sportsbook mobile betting app is part of the Meadway online sports and gaming community. Based in Canada, the group offers betting and gaming opportunities across the board, with North American sports given prominence, along with a thriving poker community, full Vegas-style casino and a host of other web-based and downloadable games. The company has been at the forefront of online wagering and gaming in North American, pioneering online sports wagering and betting on the move since 2007. It also providse the highest level of pay out in the business! 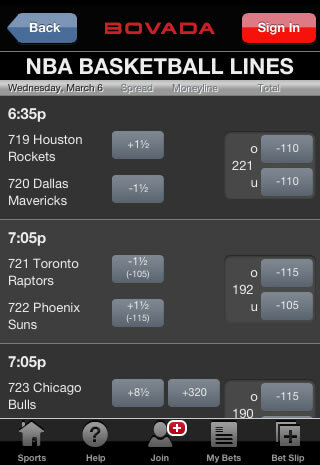 The Bovada Mobile Sportsbook is free of charge and no downloading is required. It supports Iphone 3 and above and is Android-compatible. It offers betting options on all major sports, including in-play matches and events. 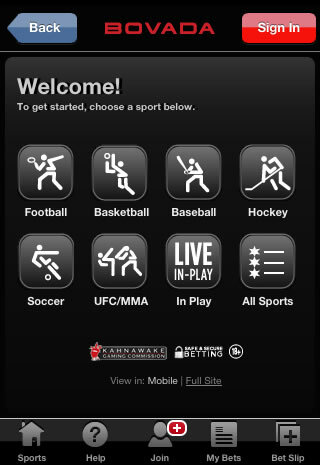 Live betting on a range of sporting events is offered by Bovada, again with special attention given to U.S sports. At present, Live streaming on in-play events is not available. A Bet Slip feature enables quick and easy bet placement, as well as showing betting options and potential pay outs, as well as providing previews of other bet types. Customers accessing the Bovada website from their smartphone are not automatically redirected to their sportsbook app, instead they are greeted by the full, unadapted online site. The full site offers an extensive range of features from sports betting to casino gaming and poker, along with news items, and therefore most mobile handsets have difficulty cramming all of the information and features on to the screen. To access the simplified Bovada mobile site customers just need to enter the url https://sports.bovada.lv/mobile in their handsets browser. It would be nice if Bovada automatically redirected iPhone, Android, Window Phone and Blackberry users to their mobile app like most other bookmakers. The mobile site is thankfully an uncomplicated affair, happily free of clutter and distracting adverts. Users are met with nicely designed icons providing quick access to the main sports markets of football (U.S.), basketball, baseball, hockey, soccer and UFC, along with a further icon for all other sports and a further one for in-play betting. Although the full range of European sporting markets are available, emphasis here is given to the most popular U.S sports, which perhaps explains why horse racing does not initially appear as an icon. Inside individual sporting screens layout and design continue to be simple and restrained; for example, the soccer section appears in a list of available in-play matches, featured big games and betting options for leagues around the world. Navigation is quick and easy and assisted by a large back button located at the top of the screen. Signing in to your account is similarly effortless via a large icon on the top right of the screen. A row of buttons along the bottom contain help and account opening sections, a home button for the Sportsbook section list of sports and quick access to your betting slip and previously placed bets so that you can speedily review your wagers. The only possible complaint may come from those wishing to switch between sports betting and gaming. In order to take advantage of the huge casino section and games available with Bovada, mobile punters will have to exit the Sportsbook and return to the main site in order to then enter the casino and gaming section. Greater integration between the two would have been welcome. All in all, however, with a plain black background and chunky graphics and font, the Bovada Sportsbook mobile site provides a nice and easy sports betting experience uncomplicated by too many buttons. Its’ simple but effective organisation and layout make laying a bet a breeze for the average sports punter which more than meets the requirements of those betting on the move. Bovada offers a 50% welcome bonus to new customers opening an account with them. Simply sign up and place a deposit in your account and receive a free bet bonus up to $250. The free bet may be redeemed on any sport, wager type or odds, but must be used within 30 days of the initial deposit. For keen punters and those able to make an initial deposit of $500 or more this represents great value. It should be noted, however, that the terms and conditions stipulate that bonus schemes are intended for U.S based customers, so it may be a good idea for those attracted by this introductory offer to clarify matters with Bovada before taking the step of opening an account if intending to take advantage of this offer. 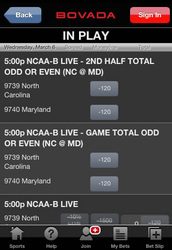 For those with a particular interest in U.S sports, the Bovada Mobile Sportsbook will provide a dizzying array of markets to bet on, from mainstays such as the NFL down to college football, basketball and baseball. European markets are covered with an emphasis on the major sports such as European football leagues and UEFA Champions league. International coverage is provided by way of golf, tennis and matches as far afield as Australian for rugby league for those wanting a punt down under. Horse racing is catered for internationally too, but again, there is a particular emphasis on the extensive U.S race market. 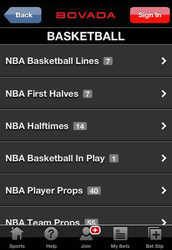 What should be noted, however, is that although a wide range of markets are made available via the mobile sportsbook, options are not as extensive as via the full online site. Horse racing, for example, is limited when compared with the dedicated racebook provided by Bovada. Betting on horse racing via the sportsbook does not have access to the huge number of races available via the racebook and many of the offers that can be accessed via the racebook do not appear on the sportsbook. For those who are serious about the horses, therefore, and wishing to take advantage of the many markets provided by Bovada, the online racebook provides best value. This can be accessed via the browser on your mobile handset of course, but is not part of the dedicated mobile sports betting site. 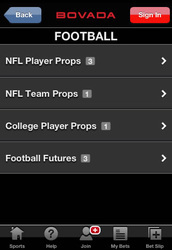 Proposition betting features heavily on the Bovada Mobile Sportsbook and is particularly prevalent on the football (U.S), basketball and baseball markets, although it is extensively offered on the European markets too. A ‘help’ button at the bottom of the screen provide customers with access to various support options and information regarding betting rules and account management. Bovada can be contacted via a customer service team available 24/7. Calls are toll free, but those calling from outside North America may need to check with their service provider first. Alternatively, Bovada will respond to email inquiries. 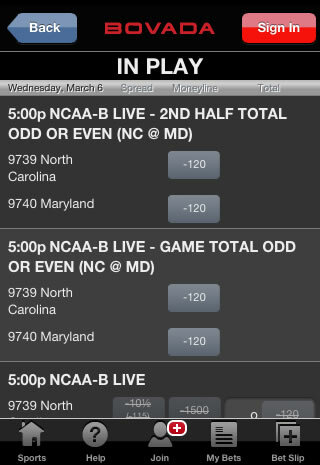 The Bovada Mobile Sportsbook is a simple, easy to use mobile betting option. 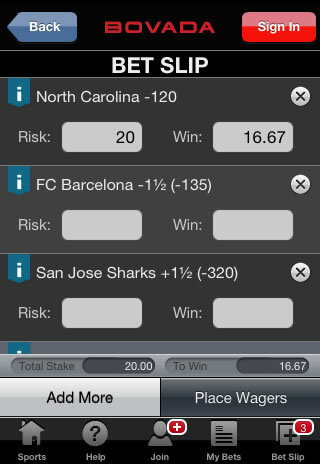 With a simple layout and design it makes betting on the move easy and effective. Coming out of North America it provides a different angle on betting for European punters and will be of particular interest to those wishing to explore the U.S sports markets in greater depth. Although Bovada does not offer the same range of offers and free bets on markets as other bookmakers, its introductory offer is highly attractive and may well tempt more than a few European customers to make the move.